Given the number of skiers happily sporting the X3 600 backpack, it's hard to imagine what CAMP could improve upon for the new Plus version. But improve it they did. Aside from the new color choices to set yourself apart from the crowd, the pack features an upgraded fabric, more solid ski carry, and the new CAMP EZ OP buckle system. The fabric is an even better combination of weight, strength, and ripstop durability than found on the existing model. The ski carry is no longer a dangling hook but a plastic ring that snaps into a wire clip integrated into the shoulder strap. The new special pull tabs on the chest and waist buckles engage a cord to automatically open the buckle with a simple tug from one gloved hand. Other than that, the X3 600 Plus remains loaded with all the ski mountaineering features you've come to expect from a Campack. Spacious 30 liters can handle long excursions while being supported by hip padding and a removable ultralight frame bar (-33g). Big mesh pockets on the sides can fit water bottles, skins, or layers that you need to access quickly. Improved Xpress Wire ski carry system lets you attach and detach skis without taking off the pack, a huge time saver. Zippered hip belt pocket can be used stash gels, clinometers, a camera, or other small items you want right in front of you. Retractable ice axe carriers securely loop around the pick, adze, and shaft to prevent dangerous shifting. Velcro and elastic interior loops are designed to secure a shovel handle, probe, and a hydration bladder. EZ OP buckle system is found on the chest and waist straps that can be operated with one hand by using pull tabs. Spacious zip pocket on the lid can be used to stow keys, energy bars, first aid kit, or whatever else you think is important. New interior security pocket can hold your wallet, phone, avalanche log book, or secret diary. Improved fabric is lighter and stronger and comes in your choice of orange or red patterns. ​Note the ski carry system fits tails up to about 150mm wide. The tail loop is a retractable cord with an internal knot that can be retied to shorten it. A+ pack! I have “downright abused” this thing and it still looks like it did the day it came in the mail. Everything you want in a minimalist, light-weight, 30 liter pack. The elastic, outside side pockets are money — ski a lap, ditch your downhill jacket, gloves, and hat in the pockets, rocket back up, jacket, gloves, and hat back on without ever opening the pack. But, let’s be real, the only thing that sets this pack apart is the side ski carry, a feature I require on a ski pack that most 30+ liter packs don’t have. Long story short: I’ve carried a pair of Dynafit Denalis with TLT 6s on the skis 14 miles, out-and-back, in a day and this pack still made me still loathe the A-frame. Once, on a busy Mount Adams spring day, at a ski-to-bootpack transition, after getting my skis on my pack and getting going in less than a minute, some sad, struggling A-framer, Voile straps in-hand, was like, “That’s cheating! I’ve gotta get a pack like that!” Exactly. This pack feels close to wonderful but misses the mark on a few points for me. - Lid is fixed in such a way that it does not tuck in to the main compartment very well. Consequently flops around when full and main compartment is not. - No way to mount a bottle holder securely. What looks in the product photos like a potential mount point is actually flimsy elastic (intended for a bladder tube) and your bottle will bounce around a lot if you try to use this. I ended up sewing some webbing onto the shoulder strap for a secure mount. You would think CAMP's own products would work better together! - Minimal storage up front. Right shoulder strap fits 1-2 gels, waist belt pocket fits 2 bars or 3 if crammed. 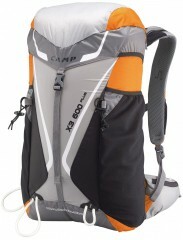 Most people are using this pack for the GT or big backcountry days, so easy access to more cals would be nice. Overall a decent product but could be better. I have the CAMP Skin Pack as well, which I love, and I sort of keep wishing that this were just a bigger version of it with a waist belt. I used this pack for the Elk Mtn Grand Traverse because my normal skimo pack would not hold all the required gear. This pack held everything comfortably and could have held a touch more in a pinch. I should note that I packed mine with all my gear as well as almost all the required team gear and had a little room to spare (we had the smallest lightest team gear possible). It is well thought out and rides well. The lid storage is accessible even when buckled down tight. The side mesh pockets are awesome on a long race like the GT since you cant keep everything you need in your suit. They allow fast access to a whole bunch of stuff and were by far the most important feature of the pack in the race. 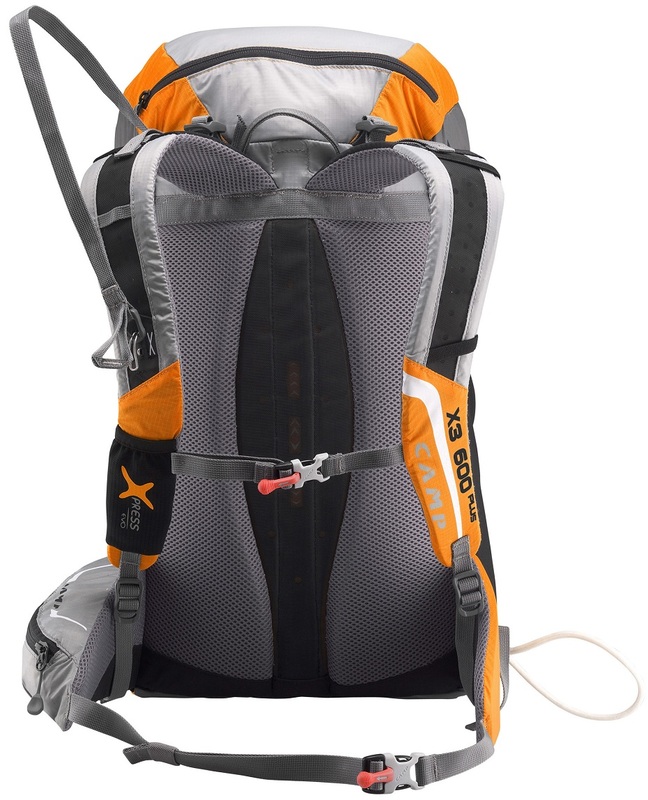 The ski carry system works fine even with a full pack and the hip belt storage is great. It mounts one CAMP bottle holder. 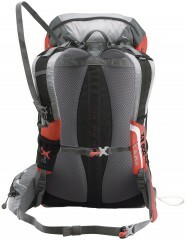 Overall, a great pack for such a race or backcountry use where you want to bring a bigger safety net with you. Are you expecting any more of these this season? Hey Ben, unfortunately not. Just using the listing as a placeholder for next season at this point. 1) When are these expected back in stock? 2) I'm working on a project that involves swapping between hiking boots and ski gear. Is this pack big enough to get a pair of AT boots into? Or, can they be lashed onto the outside in a manner that won't allow them to swing around? on the stratus and spitfire packs i see the ski tail width is only 105mm max. all my skis are bigger then that and I was wondering two things. 1. can the loop be easily cut off and replaced with a bigger one? 2. is it only the La Sportiva packs that have this limited size range or will all of my wider skis be to big for these stlye packs? 3. how long is "Pre-Order" going to take? Good questions David. The Spitfire/Stratos uses a thick piece of corded webbing that is sewn on really well and would be tough to replace. Each pack has its own size limit, some being smaller (Trab World Cup is ~100mm), some bigger (Trab Gara Aero is ~130mm). We are noting this in the product descriptions as we get them in; we expect the CAMP packs (some of which have fairly big loops) late next week, and the Dynafits shortly thereafter. I will also add this info to the comparisons when we get them all in. What is 11 + 0?